Welcome to the August reveal for Group C for The Secret Recipe Club. If you don’t know about the SRC, you’re missing out! Every month, all the participating bloggers are assigned another blog and we need to select one recipe to make from our assignment. Then we all reveal our recipe and assigned blog on a Monday. It’s always fun to look through the links to see who had your blog. This month, I received Ashley’s blog, Rainstorms and Love Notes. She shares recipes, writes about love and life and binge watching TV, her three cats and love for the Steelers (Go Eagles!). 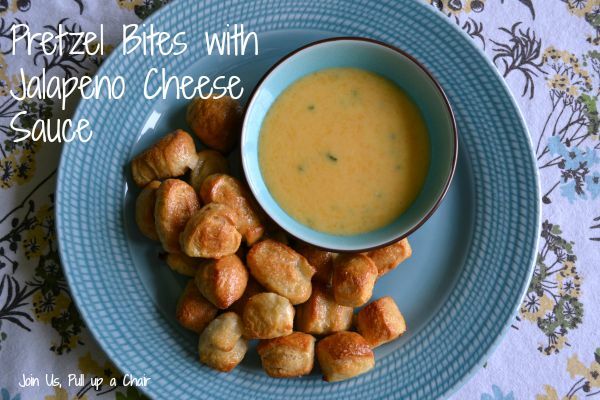 I went through all the recipes and found a great recipe for pretzel bites with a jalapeno cheese sauce. I loved the short cut in using canned French bread to make the pretzel bites. I’ve made pretzels from scratch before and it’s time-consuming. The sauce was really good and had the perfect amount of heat with the jalapeno. My daughter loved it too! Preheat oven to 375 degrees. Remove the dough from the can and slice in half lengthwise. Cut each strip into small pieces and roll into small balls. Bring a large pot of salted water to boil. Drop 10 pieces of dough into the boiling water for 1 minute. Remove the boiled dough with a slotted spoon and transfer to a piece of parchment paper to cool. Continue until all pieces of dough are boiled. Place on a foil covered baking sheet and bake for 25 minutes. While the pretzels are baking, melt 1 tablespoon of butter in a small saucepan. Add the flour and milk and whisk until smooth. Add in the jalapeno and garlic. Continue to stir until the mixture starts to thicken. Once thick, remove from the heat and stir in the shredded cheese and cayenne pepper. Melt the remaining 2 tablespoons of butter on the baked pretzel bites. Sprinkle with salt and serve. Enjoy! Check out all the other recipes in this week’s group by clicking the link below! You got me at pretzel bites!! I am a sucker for anything pretzel, and then I read here’s a shortcut with canned French bread -perfect ! Love this quicker version of homemade pretzels! Great SRC pick. Had your blog this month, and made your delicious Cheesesteak Stuffed Peppers. They are a definite keeper, and will be a regular addition to our menu. Wow on the pretzels, who knew making them could be so easy, I’ll have to try this with my homemade bread dough soon, my family will love it. I love pretzels. Especially hot, freshly baked ones! Great SRC pick! yumm —I could literally live of cheese sauce or days if my husband allowed me to hahah….this looks great! spicy and cheesy = win! I have been wanting to try to make pretzel bites, and using canned dough is brilliant! I can’t wait to try this! Happy SRC day!